Back in last October, Morningstar started to offer a new gauge to measure how average investors fared over a certain period of time when investing in open-end mutual funds or ETFs. The new gauge is called Investor Return, also known as dollar-weighted return, which takes into account the total cash inflows and outflows. Before, Morningstar only has total return data. So how exactly is invest return calculated and what’s the difference between investor return and total return? To illustrate, consider one mutual fund X, which has the following net assets and monthly cash flows. That is, the total return measures returns for an investor who takes the buy-and-hold approach during a certain period of time without making any additional purchases or sales. But is total return a good measure of performance for investors who could participate in the market at any time and do more than buy-and-hold? This question can be answered by calculating investor return. Still use fund X as an example. The beginning total net assets on December 31 are $511M and the ending assets are $795M. The IRR can be calculated using Excel function IRR, which requires a negative number. For this example, since the cash flow on December 31 is not known, the cash flow of March minuses the ending assets (-$773M) is used as the negative value. The four values in the IRR function are, therefore, 511, 187, 83, and -773, and the resulted monthly investor return is -0.40%, compared to a total return of 0.77%. What does investor return mean? 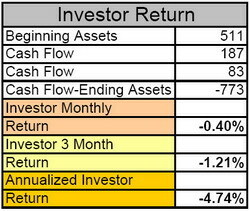 The above example shows significant gap between the two returns. Which one should an investor use? According to a Morningstar article, IR “put greater emphasis on periods when a fund is receiving a lot of inflows and its asset base is large, and less emphasis on periods when its asset base is smaller.” And a fund usually sees big cash inflow after some decent returns, attracting new money from return chasers, who start to withdraw when the fund underperformances, resulting in reduced cash inflow or even net outflow. Therefore, the fund’s cash flow indicates that investors are unable to find the perfect time to enter (inflow) or exit (outflow) the market. They are late for both and end up buy high and sell low. There’s a significant correlation between investor returns and fund volatility, and the difference between investor and total returns can give you clues about how well a fund shop treats its shareholders. The gap between investor return and total return indicates how well investors timed their fund purchases and sales. When investor return is less than total return: It means that investors didn’t participate equally in the fund’s monthly returns — more investors participated in the downside returns and less in the upside returns. This sometimes happens when investors chase returns and assets flow into a fund at its peak of performance. When investor return is greater than total return: It means that more investors participated in the fund’s upswing and less in the downswing. This can happen when investors are committed to a diversification strategy and continue to invest new monies into a fund, even when its style of investing has gone out of favor. Finally, here are the TR and IR of two funds I own: DODGX and CGMFX (clicking on “Total Returns” on the left side of the fund’s profile, then clicking on the “Investor Returns” tab at the top of the returns page). For DODGX, which is a very stable fund, IRs are consistently greater than the TRs. For CGMFX, however, the relationship is reversed.